The next generation will take cryptocurrency for granted. Isn’t that mind-bending? What you and I regarded as one of the most astounding innovations – decentralized currency – they will regard as commonplace. It’s happened before. The current generation doesn’t know what it was like not to own a mobile phone. They accept Facebook as an annoying application that their parents use to monitor their activities and friends. What year did you learn what a drone was? All of these are examples of technological marvels that the new generation regards as ordinary. Time moves forward without exception, and it will reveal wonders that are currently unknown. The crypto market is at its beginning stages, despite its relatively old age when it comes to technological trends. The reason lies in the fact that its benefits are more subtle than other technological marvels. Blockchain technology isn’t easy to implement, even if a large company has the will, manpower, and budget. Even with massive resources, some blockchain projects are a herculean effort, and it takes time to develop in-house talent and experience. And businesses – of all types – have a very dollars-and-cents mentality; if it doesn’t obviously and immediately save them money, they are much less likely to invest resources. Even at the beginning of Internet adoption, it took years to convince even large companies to purchase a domain name and publish the simplest of static pages advertising their business. And now it’s almost impossible to find even a small restaurant that doesn't have a fully-functioning website. The same will be true of cryptocurrency. Yes, the end of 2017 was a year when many investors went through a sudden realization of just how important cryptocurrency was, compared to other financial innovations, but it was just the tip of the iceberg. There is one blockchain company that has the clearest and most accurate vision of the future path that cryptocurrency, regulation, and innovation will take; Ripple. And XRP is the digital asset that is their uncontested, preferred medium of exchange for cross-border value transfer. It’s a sharp introduction for Ripple, and the article went on to note that Ripple Director of Joint Partnerships, Emi Yoshikawa, would be present on the second day of the conference, July 3rd. It’s exciting news, especially given that Ripple had announced plans as far back as 2017 for the building of a Chinese team for Ripple. Whatever the case, the theft is unwelcome news in the crypto market, especially given that Japan reacted to the Coincheck hack in January by implementing much more stringent regulatory procedures for exchange approval.5 While some additional regulation may be necessary, it’s not always the right response for government regulators to have a knee-jerk reaction to a theft. We’ll have to wait for further details about the Bithumb attack; I’m hoping that blockchain forensic science around cryptocurrency is developing capabilities to track these thefts more effectively. 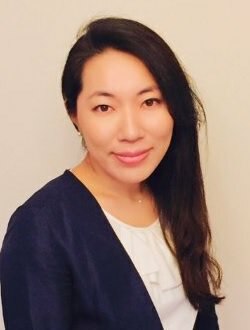 "Demand for blockchain learning, research and project-based experience is at an all-time high among university faculty and students, and this gift will go a long way in fulfilling that demand,"
One important thing to note about the donation to UT-Austin; it’s one of 17 colleges that have already been chosen to receive part of Ripple’s $50 million dollar grant. Investing in higher education is a strategic decision by Ripple that shows foresight by the Silicon Valley company; its generosity is acting as a positive influence for promoting cutting-edge research in both Western and Eastern educational institutions. On June 21st, The Times, a British newspaper included a 24 page supplement on cryptocurrencies, along with a case study that zeroed in on Ripple’s product line. It was a five-paragraph synopsis of Ripple, but quite accurate and powerful in the way that it conveyed Ripple’s value proposition for improving speed and accuracy of payments. Bravo to The Times for this accurate mainstream media coverage. It’s encouraging to know that the message about how extraordinary Ripple technology is, as well as what it can do using XRP, is starting to find its way to high-profile news outlets. Several news outlets recently posted electrifying news about how much Ripple technology is saving Banco Bilbao Vizcaya Argentaria (BBVA). The Spanish bank is using Ripple technology for a small group of its corporate customers, allowing them to pay overseas suppliers. In the crypto market, there are always doubters, but when real businesses experience the cost savings and benefits mentioned in the article, it's a resounding endorsemnt of what Ripple technology can do to save them money. A recent video showed a presentation by Asheesh Birla, Ripple’s Senior Vice President of Product, given during the (Off) The Chain Summit in Boston on April 26th of this year. It’s exciting to note that some of the examples that Asheesh Birla uses are from some name-brand Internet companies. He also provided edge-of-your-seat examples from Audi (micropayments reference) and Amazon (custom-built payments infrastructure). In addition, Asheesh talked about how banks’ global footprint is starting to shrink when it comes to international payments, while large corporates are expanding their capabilities. For me, however, the best part of the video was near the end when he described how each of the three major Ripple product offerings fit into the overall technology architecture stack of moving value. I highly recommend this video as it provides a great introductory, yet comprehensive perspective on the various Ripple technology components and how they address different needs. "We're building solutions on a protocol. So think about Google on top of the Internet. We're building software serivces that make the underlying protocol usable, for functional economic use cases." I immediately understood Danny Aranda's reference, because it's one that's been made consistently by other members of the Ripple team as well. The Interledger Protocol exists independent of Ripple or XRP, and can be used to link together any cryptocurrency network or distributed ledger to any other ledger. In fact, both Bitcoin and Ethereum have ILP plugins available. It was a concise and intuitive concept that should serve to drive home the point with many listeners. 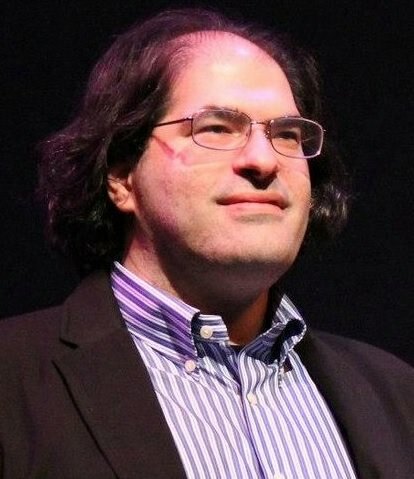 A timely blog was recently written and published by David Schwartz, the Chief Cryptographer of Ripple. The title was “Censorship and Censorship Resistance,” a heady topic when it comes to cryptographic networks. In it, he focuses on discriminatory treatment of transactions within proof-of-work systems like Bitcoin, and then compares it to Consensus models like the one underpinning XRP. If you look at most of the other listings on the referenced website you’ll see that very few blockchain companies are advertising anywhere near that level of positions. 11 Ripple is growing, and fast. The new XRP Symbol can now be seen representing XRP at most of the major exchanges and websites, but there is still some work left to be done. Various community members like @kieranmlkelly (Twitter handle) have been politely reminding exchanges of the new symbol. 'Ripple' is not the name of the cryptocurrency, and should be considered separate and distinct from XRP the decentralized cryptocurrency. Coinmarketcap is just one site, but it’s a very high-profile example of this miss-labeling. Whether intentional or incidental, the XRP Community should apply pressure to any site or exchange that still incorrectly confuses the company with the cryptocurrency. 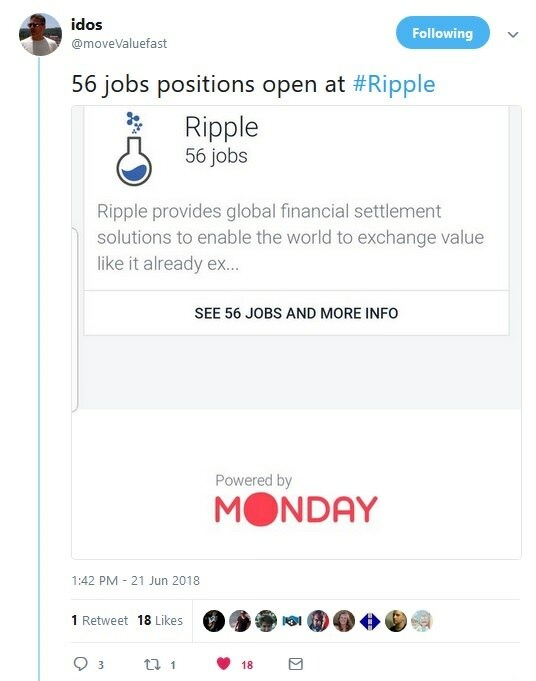 Ripple, the company, is just one of many users and businesses that make use of XRP. 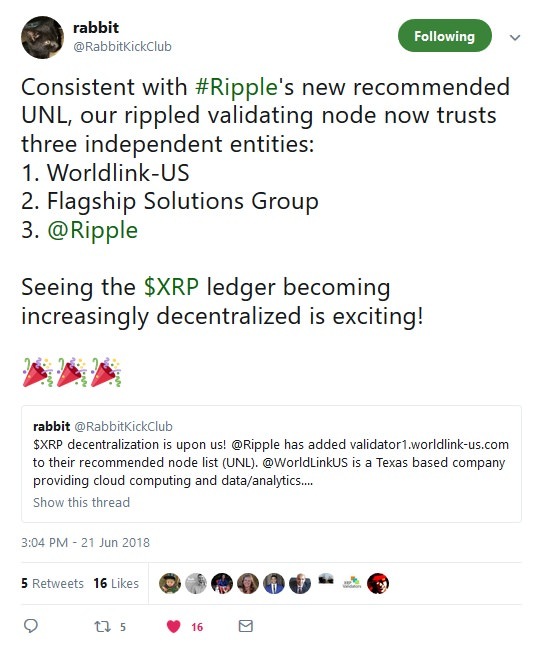 While the XRP Ledger is decentralized, Ripple provides a ‘recommended Unique Node List’ (UNL for short) for developers when they download the Rippled code from Github. This ‘recommendation,’ while completely voluntary for validator owners, has historically been a source of criticism for the XRP Ledger. The reason is that, until now, Ripple was responsible for maintaining and operating all of the validators on its recommended list. Some “proof-of-work” purists, for example, claim that this is evidence of a certain type of centralization, despite the fact that validator owners can choose to trust any set of validators that they wish. To address this criticism, Ripple indicated that they would take further steps to decentralize the recommended UNL. The next phase of the plan was then described in detail by Ripple and included a strategy that would result in complete decentralization of the recommended UNL: For every two third-party validators, Ripple will remove a Ripple-controlled validator from the recommended UNL. The “Mainstream” zone will offer trading of high-volume cryptocurrencies such as XRP starting on June 21st. The “Innovation” zone will feature higher-volatility cryptocurrencies starting on June 20th. It’s exciting to note that Zhang Jian’s former exchange, Huobi, does approximately $520 million in trading per day. It will be interesting to see how much volume that his new exchange will generate. "Definitely XRP/BTC and ETH and most likely EURO and USD (on launch day)"
The tentative launch date for XRP on DX Exchange is July 25th, but it is rumored that they will run a small beta trial for XRP trading before then with a selected group of people. The reason that fiat pairings are better than pairings against BTC or Ethereum is that it simplifies the number of steps for crypto investors that are aiming to purchase XRP. Instead of having to buy Bitcoin or Ethereum first, they can directly purchase XRP with their fiat-credited trade accounts. While there are a number of popular XRP wallets, it’s great that additional crypto wallet providers like Edge are acknowledging the overwhelming market demand by their customers and adding support for XRP. "only a few drops, with the possibility to add extra XRP as payment." You may be wondering what the context for the application might be; for now it offers completely encrypted communication via usage of the XRP Ledger's native capabilities, and the messages are real-time; they will be transmitted and received as fast as the XRP Ledger settles - in under four seconds. 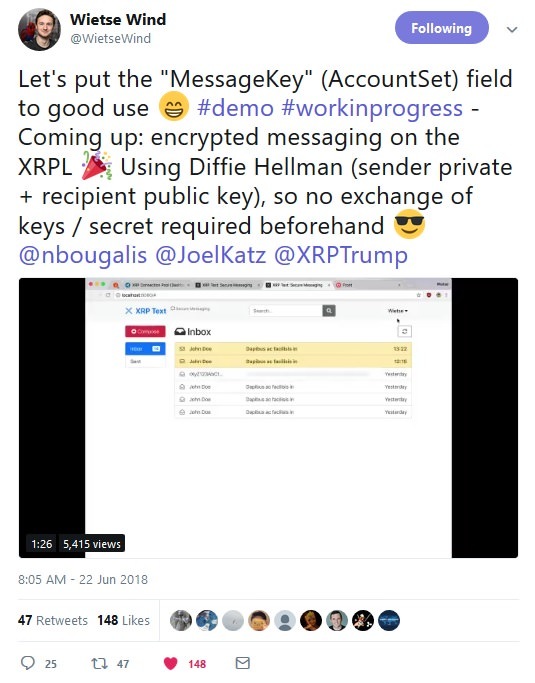 I imagine that this technique might be used by Ripple or Coil or even a third party application to facilitate communication of financial information somehow associated with the XRPL. It is yet one more incredible application developed by the XRP Community, thanks to Wietse Wind's efforts. If you’re interested in the company’s background: They state that they created - and currently maintain - the “Cryptanite Wallet” which is designed to allow users to buy and store more than fifteen cryptocurrencies – including XRP. It’s great to see a company who has previously committed to supporting the XRP ecosystem also dip its toes into the Codius hosting business. IMPORTANT NOTE ABOUT CRYPTANITE: Neither I nor my XRP Community contacts have any knowledge of this company personally, so please do your due diligence before using their wallet or hosting service. I remain positive about all new Codius businesses, but it's best to investigate a company whose product you're using before committing any resources. When mainstream press report on XRP or its surrounding ecosystem, its a noteworthy occurrence. While many cryptocurrency-specific news outlets cover details of the crypto market and its top influencers, news outlets like Fortune cater to a much wider audience. The article also went on to note that Codius has two early users: Telindus, a large Telecom based in Luxembourg, and Wietse Wind, a developer based in the Netherlands. If you’re a new member of the XRP Community, this is noteworthy, because @wietsewind is one of the foremost independent developers that work with the XRP Ledger and Codius, and has built numerous highly-used social applications and websites - including the website that you're currently visiting! Congratulations to both Stefan Thomas, the Coil team, and WietseWind for their significant media coverage in this article. From my perspective, every artist and creative content manager should be on the edge of their seat listening to this presenation; the ‘creative class’ among us has watched as their income streams are co-opted by large corporates or other ‘gateway keeper’ Internet companies that have a monopolistic advantage on reaching large audiences. With web monetization, artists have an opportunity to change all of that, and Coil is at the forefront of this movement. The future path of digital assets holds many unknowns. Coil is creating a platform for web monetization and Codius applications that could result in a beehive of viral applications. It could also completely transform Internet content delivery into a type of medium where artists and creators truly thrive and are rewarded for their work in a meaningful way. By contrast, Ripple is targeting remittance processors and banks. The use case for cross-border value transfer for banks and nostro accounts is measured in numbers that are are difficult for most human minds to conceptualize: trillions and quadrillions. Remember that Ripple is laser-focused on dominating the market for both cross-border and domestic payments. Micropayments provides a vast sea of unknown future possibilities, with turbulent waters roiling with limitless potential. They will need a digital asset that can support tens of thousands of transactions per second. And which cryptocurrency network supports native payment channels that can scale to transaction levels far beyond VISA? That’s right: XRP. The future may be difficult for some to imagine, but the companies that are positioned to champion XRP’s use are the best bet for charting a course through the creative chaos.